Let all ingredients come to room temperature. Put first three ingredients in food processor and blend until leaves are all chopped finely. Pour into graham cracker or chocolate pie crust. Bake at 300° F for about 40 minutes. Remove before it browns. Chill well in fridge before serving. 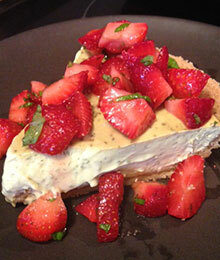 Optional: Serve with fresh chopped strawberries and mint leaves.